The sampling and analysing of lubricating oils dates back more than 70 years when it was first used in the railway industry to detect deterioration in the quality of the lubrication in trains and locomotives. Since that time it has been used in many applications both in civilian and military and latterly as part of Condition Monitoring Programs and trending of such equipment as industrial gearboxes, pump chambers, engines, compressors, industrial clutches, switchgear etc. Reduce the cost of repairs which result from secondary damage caused when machines ‘run to fail’. All rotating machinery components will wear with use. Contact and fatigue will produce a continuous stream of microscopic metallic particles which suspend in the lubricant. It is the concentration, size, rate and composition of these partials which provide indications of increased wear rates which could develop into failures. 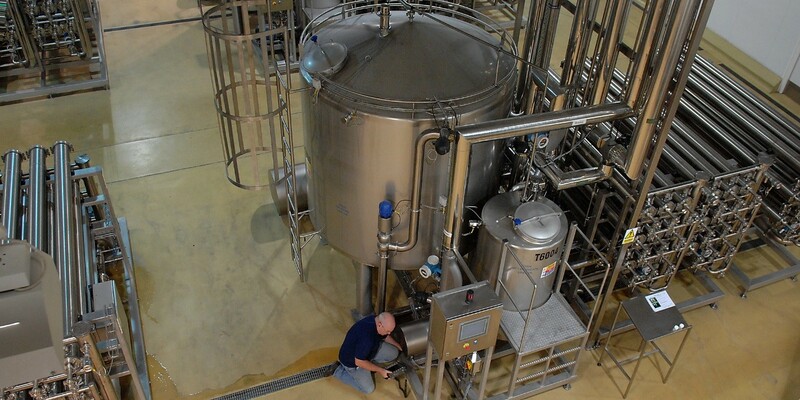 Taking samples of the lubricant, in most instances while the machine is in operation, can be performed on a regular basis and can help indicate when abnormal wear or contamination is occurring. The oil becomes a working history of the machine. Particles caused by normal wear and operation will mix with the oil. Any externally caused contamination also enters the oil. 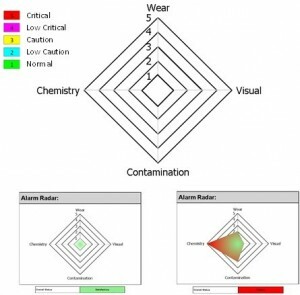 By identifying and measuring these impurities, you can calculate the rate of wear of the components. An oil analysis also will suggest methods to reduce accelerated wear and contamination. A typical oil analysis identifies the presence of various materials by knowing the base materials from which the components are manufactured it can be determined which parts are wearing quicker than others. It also allows you to investigate that the appropriate lubricants are being used. Some wear is normal, but abnormal levels of a particular material can give an early warning of impending problems and possibly prevent a major breakdown. 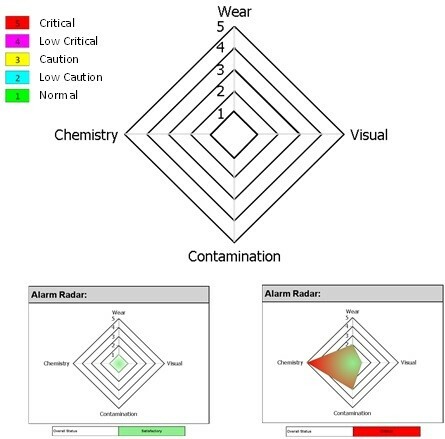 Early detection of wear or contamination can also allow corrective action to be taken before major damage occurs. Probably one of the major advantages of an oil analysis program is being able to anticipate problems and schedule repair work to avoid downtime during a critical times. One purpose is to provide a means of predicting possible impending failure without dismantling the equipment. A person can “look inside” a gearbox, pump, engine transmission or hydraulic system without taking it apart. Over a number of years the life expectancy of the equipment can be calculated by trending the results of the samples coupled with the periodic overhauls where visual inspection is possible. Oil sampling of pump chambers can detect ingress of fluids indicating the mechanical seal is allowing water or other fluids into the oil. In transformers and switchgear oil analysis can help to determine potential problems with the quality of the oil, giving advance warning of insulation degradation or overheating. CPM use oil analysis as part of its CBM and LCM programs where a level of understanding of what is happening inside a motor, pump, gearbox, and transformer is important without the need to take the equipment out of service. 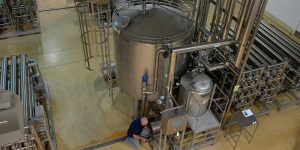 It has resulted in extending the life of the equipment, reducing unscheduled production downtime and in turn reduced the cost of the repairs budget. For further information, contact Charles McAllister at info@cpm-uk.com or call 0161 865 6161. "Thank you for the support and great service. Unit was returned to us earlier than expected, which minimised the down time and loss of production, which was great. Very good communication throughout the repair process and the quotation explained reasons for failure etc. You also managed to fix the brake which hadn't been working for a while! So overall great service, would use you again in future."